Posted by Shelley Grell on November 16th, 2011. The Canterbury Software Summit featured an impressive line-up of speakers this year. It was held at Addington Raceway on 8 September, 2011. 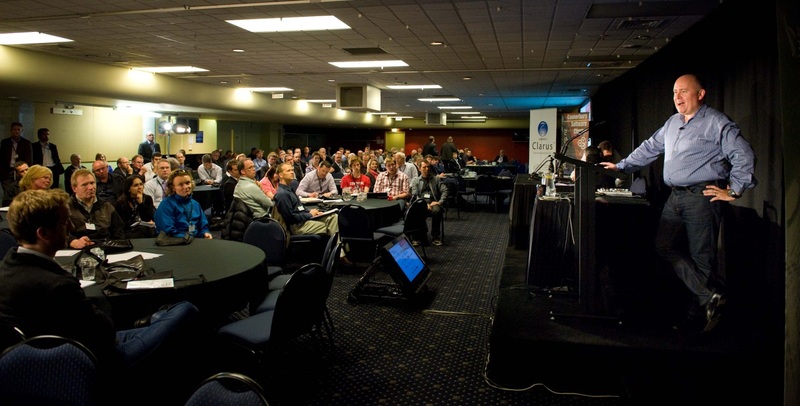 With nearly 500 registrations, the annual event surpassed everyone’s expectations as the largest event ever organised by the Canterbury Software Cluster, and the largest event of the Rutherford Innovation Showcase series. The theme this year was “Can you compete in the international market” but equally it could have been “Can you compete in the mobile market”, for nearly every presentation touched on smart phones and mobile computing, and with good reason. In 2007, 87% of mobile consumers were not yet online, but just four years later that statistic is reversed. And the message was clear: if you’re not ready to serve your software to mobile devices, you’d better get ready – and quick. Scott Bradley has clearly built his business on it – VoucherMob’s meteoric growth is attributed to the ability of smart mobile phones to transform the buying experience with location-based marketing. Retailers like Pumpkin Patch, Bivouac Outdoor and Powerstore are able to engage with potential shoppers because of their ability to send communications like coupons or offers to the consumer when and where they are going to be most receptive to it, and to accept payment through the phone like a “digital wallet”. People are also using their phones to play games. Commonwealth Bank’s Andy Lark talked about the importance of letting consumers “play” with your brand, and Tyone McAuley described how the traditional gaming industry is fundamentally changing. People are seeking “bite-sized entertainment” anytime, anywhere – on the train, in a waiting room, within Facebook (with a nod to the success of Zynga’s Farmville). This is greatly affecting traditional game development software houses like Sidhe. Lark told the audience that it’s imperative to design today’s software applications for mobile devices – because that’s where everything is going to happen, and if you don’t design your apps for it from the start, you’re going to struggle. In fact, location should be used as a “lens” for the advent and design of new applications – like a mortgage application at Commonwealth Bank which allows you to walk up to a house to take a photo and record GPS coordinates, and then serves up any previous real estate listings and sale details, and finally allows you apply for a mortgage right there on the spot. Mobile devices and social media are totally interconnected – 80% of Twitter usage is on mobile phones, and 40% for Facebook. He told the story of a woman in a mall who tweeted that she’d lost her eftpos card, and was unhappy that she couldn’t shop – customer service saw it and arranged for a new card to be delivered immediately. Now that’s service in the new mobile world. David Brebner suggested we are moving into the “post-PC” world, and that traditional web browsers are not the optimal way for people to interact with a computer and consume information. Unlimited Realities’ touch or “gestural” software runs on a number of different hardware platforms. ‘Fingertapps’ makes it easier and more intuitive for people to use their devices effectively – whether for games, shopping, or socialising. Leading corporate IT departments need to embrace the plethora of technologies out there, according to David Scott of Z Energy. He refers to it as “consumerisation” – business users bringing their smart phones, iPads and every other device under the sun to their IT manager and asking them to make it work on the secure, orderly corporate network. And IT departments of today (or Business Technology departments as David calls them) need to embrace that change, because allowing business users to work on the devices of their choice makes them happier and more productive. The Summit speakers provided lots of food for thought and got everyone thinking about how they can incorporate some of the ideas into their own business. And with the New Year fast approaching, this is the perfect time for us all to take a fresh look at our business strategy and consider how we too can capitalise on the bourgeoning mobile market. To find out more you can download the presentations from the Canterbury software website at www.canterburysoftware.org.nz.